In its hey day, Morgan was one of the busiest South Australian Murray River ports. Morgan is 165 km north-east of Adelaide by road and 315km by water from the river's entrance to Lake Alexandrina. The township is located on what is often referred to as the Great Bend, the Great Elbow, or more prosaically, North-west Bend on the Mighty Murray. It is also a fantastic gateway to the National Landscape region of the Flinders Ranges. You can also experience other local historic towns of Burra and the world-class wine region of Clare. There is a good shopping supplies, two hotels, a swimming area, golf course, bowling club, caravan park, camping sites and plenty of good fishing areas. The town is also great for watersports and skiers who enjoy local riverfront accommodation and the riverfront reserve for mooring. Morgan, during the 1800's was the home port of hundreds of paddle steamers which carried cargo and passengers up the Murray-Darling River system. Morgan, therefore, is one of the truly historic Australian towns which is a must see by those who are interested in this great Australian history. Morgan, incidentally, is also the commencing point of the 320 kilometre Morgan/Whyalla Pipeline. There are many reserves in the area; notable among these being Cadell, Morgan and Hogwash Flat. Hogwash Flat, incidentally, is a particularly good fishing spot even though it is somewhat difficult to navigate in craft that draw more than a couple of feet of water because there is a huge shallow sand bank, however, no navigation problems should be encountered. Across the river from the town, Morgan Conservation Park is a favourite haunt for fossil fossickers. In this locality there are quite a number of stranded barges from the paddle wheel era, some are high and dry, other are submerged. These are well worth seeing and, incidentally, well worth fishing around. Morgan has preserved its history with considerable flair. 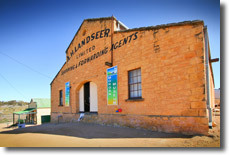 The restored wharf precinct captures the early river trading days, and the town's museums bring to life the stories of the paddle steamer era. The Landseer Building, once a shipping agent's storehouse, is filled with a remarkable collection of old engines and wagons - even a mural made from wool. The historic railway station that once handled an assortment of cargo and passengers transferring from river to rail has been transformed into a museum of river and rail history. Make time for a close look at the fascinating historic photos here. The Morgan historic walk takes you around the town's historic buildings and towering wharves. Most of the historic buildings, including the customs house and courthouse, are located on Railway Terrace. The 12m high wharves were constructed exclusively for the paddlesteamers which once plied the Murray-Darling Rivers system. It also meanders past a number of historic landmarks, revealing stories of the town's past, and leads to a panoramic view of the town and river. Take the path of the 1839 expedition party led by Governor Gawler from Morgan to Mt Bryan. A journey of discovery that ended in tragedy with the mysterious disappearance of one of its expedition members - a young man from England, Henry Bryan. The trail will lead you on the expedition’s land adventure around Morgan and where it is believed to be the sites of Henry’s last known whereabouts. Two hotels boast prominent locations overlooking the huge lawned riverfront - a popular recreation spot for residents and visitors. There's also a riverside caravan park, B&Bs and motels, and the town is homeport for an impressive fleet of houseboats for hire.